Double click on the ChartSmartXL setup.exe file to run the installation wizard. If your XLSTART folder contains some kind of temporary file, delete the temporary file and see if this solves the problem. 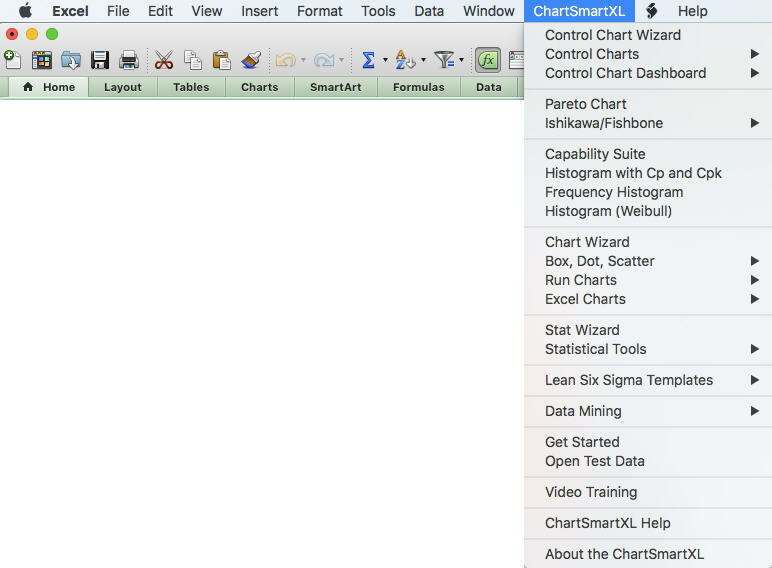 If your folder is missing the ChartSmartXL.xlam file, then close Excel and re-reun the ChartSmartXL installer. Test data for the charts is located at c:\ ChartSmartXL\ TestData. You can use these spreadsheets or your own data to practice with the charts. Basically you just select your data, go up to the menu bar and select the chart you want to run. 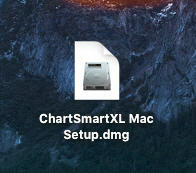 Completely quit out of Excel and locate the ChartSmartXL.dmg installation file that you downloaded. Then follow the prompts to install ChartSmartXL. Note: If the installation wizard ran correctly, but you don't see ChartSmartXL on your menu bar, Excel may have pending updates needing to be installed. To check, go directly into Excel and select Help > Check for Updates. I Have a New Computer. How Do I Restore the ChartSmartXL? Reinstall from your downloaded installation file. If you can't find your Install file, click on the next drop-down to determine whether you can get a replacement or need an updgrade. If you purchased the ChartSmartXL in the last 12 months, we can look up your record and send you a replacement install file electronically for only $35.00 USD. If we find that you purchased more than 12 months ago, we will need to change your order to an upgrade. If it has been more than 12 months, you will need to purchase the upgrade. Upgrade a previously purchased ChartSmartXL license to take advantage of new time saving features and functionality. If you have two or more versions of Excel on your PC, the installer assumes that you want to put the ChartSmartXL in the most recent version. Find out where the ChartSmartXL were installed by searching on chartsmartxl.xlam and copy them to the correct folder. ChartSmartXL FAQs on pricing, licensing, compatibility, etc. If you have any other problems...page faults, can't compile, etc. we have found that it's rarely a ChartSmartXL problem. So, click here to look for answers in Microsoft Support. If you cannot find an answer after searching our site, please complete the following trouble reporting form. We will respond within 24 hours, Monday thru Friday. Thank you. How do I find my Excel Version? 1.) What did you do? 2.) What did you see? 3.) What did you expect? Purchase ChartSmartXL through our secure shopping cart! If you do not know your Win/Mac/Excel Version, click here to download an Excel file that will check the information for you. Look in your Downloads folder, open the Excel file, copy the information in the window (shown below) and place it in the problem description.